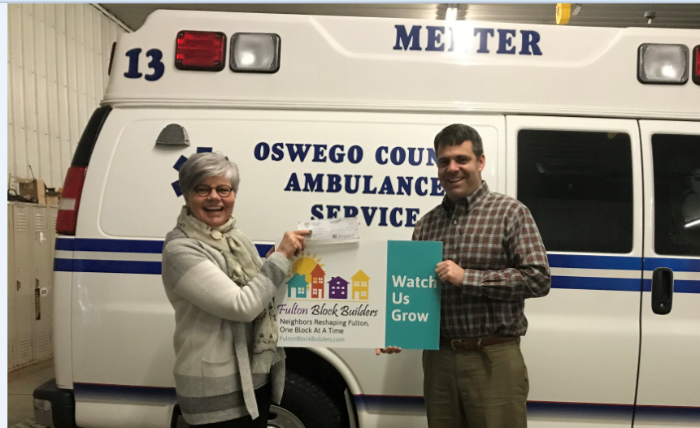 FULTON, NY – Operation Oswego County Inc. has donated $2,500.00 to the Fulton Block Builders (FBB) putting FBB closer to our goal!” said Linda Eagan, FBB Administrative Director, reaching 85 percent of the total fundraiser goal. “Fundraising for the 2018 Grant Challenge has been quite successful. In addition to Operation Oswego County, FBB recently was notified of support from Chuck Handley at Burke’s Home Supply. Residents participating in the Block Challenges will be happy to know that for the second year, Burke’s has moved us closer to our goal and will be offering discounts to approved FBB grant recipients” continued Eagan. City residents who would like to participate in the program need to form a neighborhood group with 50 percent of the property owners on their block and have them sign the Pre-Application stating that they are interested in the matching grant funding and want to learn more about FBB. Blocks can be made up of both sides of one street or of the homes within 4 streets. FBB Ambassadors are available to help applicants through the process. Follow us on Facebook at look for information on our website. Operation Oswego County’s mission is to establish and implement sound economic development strategies to enhance the economic vitality of Oswego County’s businesses, industries and citizens leading to an overall better quality of life. “Key to our mission is the creation and retention of job opportunities, diversification and strengthening of our economic base, and developing the local economy in a planned, organized and environmentally friendly atmosphere. We think the Fulton Block Builder project fits into this mission perfectly” said Michael Treadwell, Executive Director. Recently, the Fulton Block Builders were awarded for their volunteerism. In 2007, the Greater Oswego-Fulton Chamber of Commerce created a new award in Jan Rebeor’s honor: the Jan Rebeor Community Champion Award. Every year, the Chamber presents this prestigious award to a Chamber member from the greater Fulton community who has shown an unselfish long-term commitment to the Greater Oswego-Fulton Chamber of Commerce. On Tuesday February 13, 2018, Jan Rebeor chose to present the Community Champion Award to a group of individuals; the Fulton Block Builder Volunteers. The volunteers are humbled to be recognized by Mrs. Rebeor. She is long-time advocate for the city of Fulton and embodies the strengths-based approach FBB is founded on. Not one to sit back, Rebeor is actively involved with Fulton’s Project Bloom, the annual City of Fulton Community Development Agency Home Show. She also lends her time and talent to the United Way Stone Soup luncheons, St. Luke’s John Foster Burden Fund, Fulton’s Tree/ Arbor Day Committee, Tunes in June, Friends of Voorhees Park, Jazz Fest, and the City of Fulton’s Christmas lighting and decorations, just to name a few. FBB strives to encourage community activism, like Jan’s, in residents by building a sense of community and focusing on civic engagement while empowering residents to work together. FBB’s goal is to have residents become engaged in their community and neighborhood and to take a proactive role in creating positive change. FBB is encouraging neighbors to get-together and complete the pre-application for the 2018 Block Challenge. Another way to become a part of FBB, is by donating to the 2018 campaign today. What’s even more exhilarating is that every dollar you donate is matched two-to-one by the Richard S. Shineman Foundation. Remember, all donations are tax deductible and go directly to the Block Challenge grants and promotion of the program. There are no paid staff! 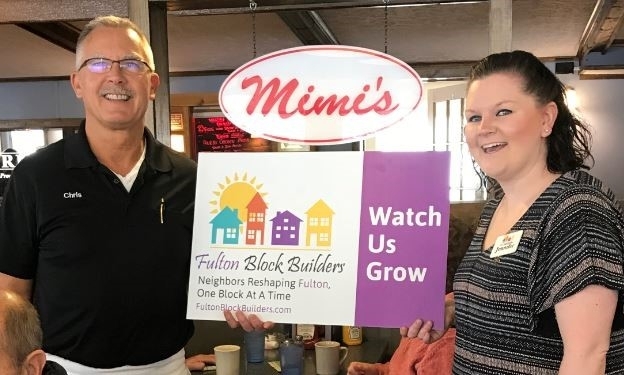 FBB donations can be made on the website at: https://www.fultonblockbuilders.com/donate/ or by mail: Fulton Block Builders; 125 West Broadway; Fulton, New York 13069. From the left, Jennifer Whalen, Reyne Pierce, Fulton Block Builders (FBB) volunteers, Karen Perwitz, of Operation Oswego County Inc. (OOC) and FBB, Michael Treadwell, Executive Director OOC Inc., Evelyn LiVoti, Austin Wheelock of OOC and FBB committee members Cheryl Baldwin, Carol Streeter and Penny Halstead. In 2018, ANY HOMEOWNER in the city will be eligible for grant awards that use these historic colors. Paint Fulton – Find Your Color provides Fulton residents with a selection of historic color schemes to use for painting their homes. Up to 50 possible combinations of colors are possible when using the 10 schemes (See how on the Fulton Block Builders Website). Only the colors within a single scheme can be used. Property owners do not have to use all of the colors in a scheme, but must use at least two out of the 4 available (body, trim, accent, bonus colors). Homeowners can fill out a simple application. If your application is approved, paint your house using one of the historic color schemes. The entire house must be painted, and if the project is completed by October 31, 2018, you will receive up to $500.00 reimbursement check. What’s more - you can combine the Paint Fulton Bonus with the FBB Block Challenge Award and the corner bonus. Giving one homeowner a chance for up to $2,000.00 in reimbursements. Awardees will have a photo of their home featured on the Fulton Block Builders website and Facebook page. Find Your Color was prepared by Architectural Historian, Susan Arena, who grew up in Fulton but now resides and works in the greater Boston area. Find Your Color provides definitions to help homeowners decide what style their home is. Once the style is determined, homeowners may select an approved color scheme from the coordinating chart, found in the Paint Colors section. By using the charts, each style can identify acceptable paint colors and where to use them appropriately. “Please note that these paint schemes are guidelines and the application of colors to specific elements will vary depending on the intricacy of the design. If you have questions or need assistance, I am happy to talk with any homeowner.” said Arena. Today Susan is an Architectural Historian and meets the Secretary of the Interior's professional qualification standards, in the areas of Architectural History and Historic Preservation. It is Susan’s love of history, her hometown and her keen sense of community that has led her to volunteer to put together historical paint palettes for homeowners in the city of Fulton to refer to. In 2007, the Greater Oswego-Fulton Chamber of Commerce created a new award in Jan Rebeor's honor, the Jan Rebeor Community Champion Award. Every year the chamber presents this prestigious award to a chamber member from the greater Fulton community who has shown an unselfish long-term commitment to the Greater Oswego-Fulton Chamber of Commerce. 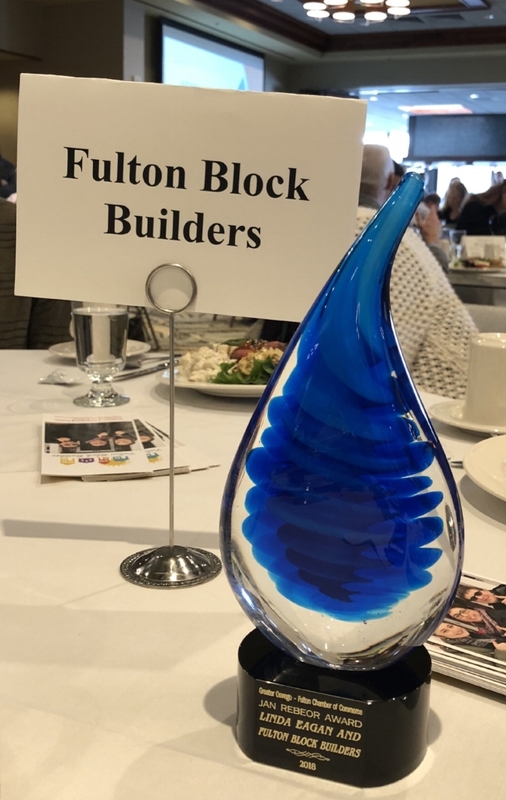 On Tuesday February 13, 2018, Jan Rebeor chose to present the Community Champion Award to a group of individuals; the Fulton Block Builder Volunteers. The volunteers are humbled to be recognized by Mrs. Rebeor. She is a long-time advocate for the city of Fulton and embodies the strengths-based approach, Fulton Block Builders (FBB) is founded on. Not one to sit back, Jan is actively involved with Fulton's Project Bloom, the annual City of Fulton Community Development Agency Home. She also lends her time and talent to the United Way Stone Soup luncheons, St. Luke's Foster Burden Fund, Fulton's Tree/Arbor Day Committee, Tunes in June, Friends of Voorhees Park, Jazz Fest, and the City of Fulton's Christmas lighting and decorations, just to name a few. FBB strives to encourage community activism, like Jan's, in residents by building a sense of community and focusing on civic engagement while empowering residents to work together. FBB's goal is to have residents become engaged in their community and neighborhood and to take a proactive role in creating positive change. Another way to become a part of FBB is by donating to the 2018 Campaign today. What's even more exhilarating is that every dollar you donate is matched 2-to-1 by the Richard S. Shineman Foundation. Remember all donations are tax deductible and go directly to the Block Challenge grants and promotion of the program. There are no paid staff! The grassroots neighborhood revitalization program that completed 126 exterior home improvement projects in 2017 is back for a second year, and has already started engaging new stakeholders throughout the city of Fulton. 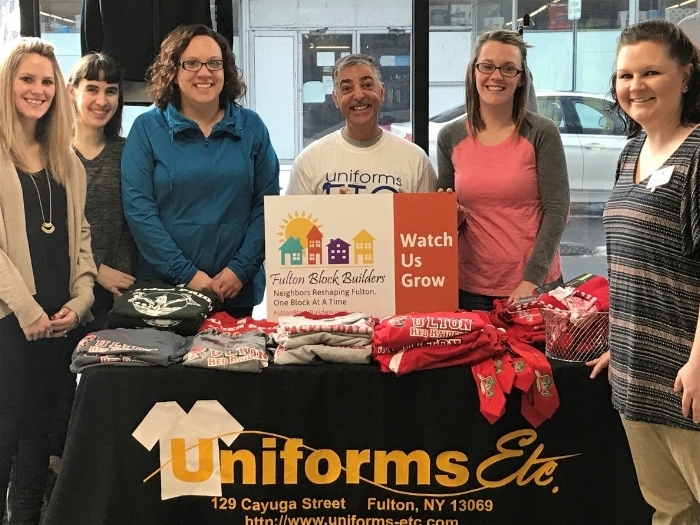 After a successful initial year of community building and property beautification, the Fulton Block Builders (FBB) wanted to find a way to share information about the Block Challenge program with more city residents, said FBB Administrative Director Linda Eagan. 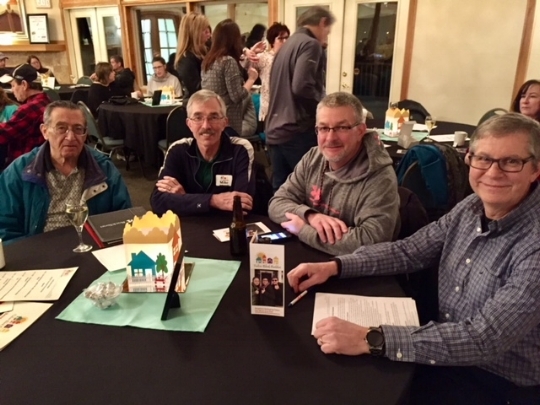 Participants from last year’s program suggested hosting an informational meeting, which Eagan and FBB volunteers facilitated on Jan. 17 at the River Vista Conference Center. “We had seen with many nighttime meetings that life can often get in the way and they aren’t really well attended,” said Eagan. The FBB meeting proved to be an exception, with more than 80 individuals present to learn more about the Block Challenge program. As part of the presentation, Eagan gave guests an overview of FBB and the Block Challenge in particular, which provides property owners with a dollar-for-dollar match of up to $1,000 for exterior home improvements. The unique feature of the program is homeowners must participate together in order to receive funding. At least 50 percent of the houses in a block or cluster must commit to completing exterior repairs in order to be eligible for the funding. Eagan said while the Block Challenge’s first year was a success, there are still many people with questions about how the program works. One of the most frequently asked questions she receives is about program funding. “People think we’re a government program, but we’re not,” said Eagan. She said FBB is a grassroots, neighborhood beautification program that relies on donations to operate. One of the project’s biggest donors is the Shineman Foundation, which has offered FBB a second matching grant of up to $100,000 to support projects in 2018. The grant doubles any donations made by businesses or individuals, offering $2 for every $1 raised. In order to maximize the Shineman funding, FBB must raise at least $50,000 by the end of April, said Eagan. “It’s all street appeal,” said Eagan, explaining the Block Challenge funds can only go toward exterior repairs and beautification efforts. Eagan said popular projects in 2017 included landscaping, rebuilding front steps, and replacing sidewalks, windows and doors. While the list of potential projects is extensive, Eagan said there are a few items FBB does not fund. She said an example of a project that would not receive FBB support could be if someone owned a property with multiple residences and realized there was not enough off-street parking for all of their tenants. Eagan said FBB would not provide funds for the property owner to expand the driveway over their grass and lawn. Along with preserving green space, FBB also looks to keep the original charm of Fulton houses intact. Eagan said an example of a project that would not receive support would be if a homeowner wanted to remove hand-carved knoll posts from their front entrance and replace them with two-by-four boards. She said FBB also looks to preserve original wooden siding rather than remove and replace it with vinyl. In 2018, ANYONE in the city can receive a $500 reimbursement if they utilize the Historical Colors. For more information on applying for Paint Fulton or Block Challenge funding, visit www.fultonblockbuilders.com. Eagan reminds all property owners interested in the Block Challenge to complete their pre-application before the March 16 deadline. Once they have recruited at least half of the neighbors living on their block or in their cluster and submitted the initial application, representatives from FBB will meet with applicants to explain the fine details of the program and help create a strong application to be submitted before April 18. The Eggletons stand in front of improvements they made with support from the 2017 Fulton Block Builders Block Challenge. They used the matching grant program to update windows and add new landscaping to their front lawn. The deadline for pre-applications for the 2018 Block Challenge is March 16. For more information visit www.fultonblockbuilders.com. Pathfinder Bank, InterFace Solutions, Northern ACE Home Center and River Vista provided financial and printing support to put the Informational Event on, which means none of the money spent will take away from the grants that Fulton Block Builders can distribute in 2018. Partnerships, relationships, pride, beauty and neighborliness are the foundation of the Fulton Block Builder program. This kind of business support is testimony to what can be accomplished, said Eagan. Become a part of this exciting piece of Fulton’s history by donating to the 2018 Campaign today. What’s even more exhilarating is that every dollar you donate is matched 2-to-1 by the Richard S. Shineman Foundation. Remember all donations are tax deductible and go directly to the Block Challenge grants and promotion of the program. There are no paid staff!